Kat Zhang’s Publication Story & Advice for Aspiring Writers + giveaway! I love finding debut authors who are able to combine an original story and strong voice. Last year’s What’s Left of Me by Kat Zhang, the story of two souls inhabiting a single body, touched me with its thoughtful mood and lovely writing, and I’m so excited about seeing Addie and Eva’s story continue in its sequel. You probably already know that the author recently graduated from college, and it’s mind-boggling to think that she juggled writing, querying, revisions, and schoolwork all at once. As part of the official Once We Were blog tour, Kat is joining us today with a guest post on her journey to publication, as well as her advice to aspiring writers. I want to know how she did it…don’t you? I remember being seventeen, after finishing up my first book (not What’s Left of Me! ), and not having any real idea about the industry. I can’t even remember how I got started learning—probably the internet! I do recall reading a ton of writing books, and getting the print version of the guide to literary agents or whatever it was called, and writing down names that represented YA. Weirdly enough, back when I was querying my first novel, I only wanted to send them out by snail mail. I think there was something concrete and business-like about the business of typing, printing, and addressing a letter that appealed to me. After all, I’d been chasing this publication dream since I was twelve, but it had always been an nebulous thing. Putting stamps on envelopes…sending them off to NYC…it felt legitimate. I think I probably queried about ten or twelve agents, which felt like a lot at the time! Unfortunately, none of those SASEs included came back with a positive answer ;) Fortunately, I had read enough advice online (I think my main resources back then were QueryShark and Miss Snark) to know I should bunker down and write another book while waiting for query replies. I started a book named Hybrid during this time to keep my mind off the query jitters. This, of course, later became What’s Left of Me. By the time I finished the first draft, I was a freshman in college—and, more importantly, I stumbled across a blog called Let the Words Flow (now Pub(lishing) Crawl). Some of the ladies already had agents, one even had a book deal, and there I was freaking out about margin sizes and what to put in my query bio (I never did figure it out, and left it blank!). Publishing can seem utterly overwhelming. There’s a wealth of information, to be sure, but some is outdated, and much is a matter of opinion. It was easy for me to get lost in the minutia (1-inch margins!) rather than try to figure out the whole beast of a thing. Having mentors helped beyond measure. They not only aided me in concrete things (how to write a query, how to format a ms), they made me believe that publication was possible. It wasn’t something that happened to “other people”—amorphous, slightly magical people who I’d never meet. Last summer, three of the other ladies from Pub Crawl and I went on a two-and-a-half week tour with the goal of giving back a little to the bookish community. We’d all started out as young writers, and had been helped in our own publishing journeys by a number of mentors. We couldn’t hope to be a perfect book guru to every young writer we met, but we hoped to inspire and guide as much as we could. 1. Finish the book. If you’ve already accomplished this, hooray! But if you haven’t, don’t underestimate the difference this makes. It’s one thing to write a lot of nice scenes. Another thing entirely to craft a coherent story with a beginning, middle, and end. But seriously, in hindsight, I would tell myself to read more in the genre. Not only does it let you know if the “shiny, original” idea you have isn’t actually that shiny, it lets you know how other people have written stories similar to your own. I don’t believe that reading in a genre, knowing the “usual structure” (or, to be more blunt, “cliches/rules”) of a genre means you’re going to fall into the same. Know the rules so you can break them, right? I could go on, but I promised just the highlights! Thanks for letting me on the blog and helping me celebrate Once We Were’s release! Once We Were (Hybrid Chronicles #2) will be out in stores and available online on September 17, 2013. Get the latest news and updates on Kat Zhang’s projects through her website and Twitter. Win Both Hybrid Chronicles books! 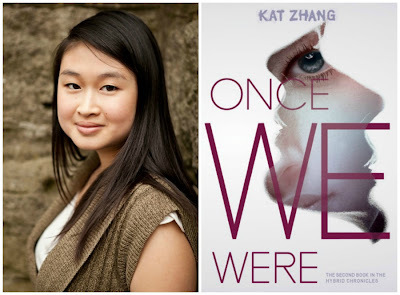 Thanks to Kat Zhang and Harper Teen, we have an autographed paperback of What’s Left of Me and an ARC of Once We Were to offer to our readers. All you have to do is leave a comment below and fill out the Rafflecopter form! Additional entries may be earned daily by tweeting, pinning, etc. Open to U.S. and Canadian residents aged 18 and up, or 13 and up with parental permission. See the entry form for complete rules. Good luck! Follow the Once We Were Tour! So what do you think of Kat’s journey to publication? Have you read The Hybrid Chronicles, or are you planning to? Passenger by Alexandra Bracken: giveaway! Kat Zhang is truly inspirational. I can’t wait to read her books. I am sooo excited to read these books. I hate to judge a book by its cover, but I can’t help it. They are so beautiful! Seems like an interesting story as well! Really blown away by this series! I already own both of the books, but I would love to win signed copies! Kat Zhang sounds like such an amazing author and person overall. Would really love to meet her someday! I was so surprised when I read What’s Left of Me and found my self loving it. I did not expect to fall in love with the story and struggles of the characters as much as I did, and I can’t wait to see where their story goes next! I already own both of the books but signed copies! That is a dream come true. Would have loved to meet the author in person to get it signed, but beggers can’t be choosers. I would still love to meet her, though! She sounds like a really awesome person. I’ve just recently started reading YA books and stumbled upon this site. I’ve always thought YA novels are “too young” and not mature but after reading Hunger Games and Clcokwork Angel, I was hooked! I would love to explore the world of YA books more and read the Hybrid Chronicles. My friend who’s a blogger fangirl over Kat and Kat had written such a wonderful book — overwhelming but in a good way. And it really caters to the genre and age group she intended to write because she (Kat) is in that age group. So the reader and the writer had that snap of a connection. I haven’t read the first book, but I love the concept of it. It always awes me when I see such sucessfully writers right out of school. Totally inspiring! I haven’t read the first one but the series sounds so original and intriguing. I want to read it so I can learn about what a world with hybrids in it would be like. I have no reason to read anything, i just want to. I have been wanting to read this series since I first heard of it, but unfortunately my library for whatever reason doesn’t carry it and I just can’t afford to buy more than 1-2 books per year. So needless to say, this would be awesome. As for Kat, she is incredibly inspiring. It is unbelievable that she was able to write a book in college. I feel like I barely had time to read one!! Love this post! I haven’t read any of Kat’s books, but what a great story and how wonderful that she is mentoring other writers! This is great information. I’m definitely intrigued to read Kat’s books now! Wonderful and inspiring blog post! It is definitely what I need to read at this moment. Thank you for sharing your story. I’m looking forward to reading this book and any others you will write in the future. Thanks to Midnight Garden for hosting. Wonderful and inspiring post. Thank You for sharing and I look forward to reading the books, and of course others you will write in the future. It’s so exciting to hear how someone juggling real life (college, etc.) still manages to put pen to paper and finish a book! I’m still working on my first and can totally relate to all the questions buzzing around about queries and margin! So it was really helpful to be reminded of rule #1: Finish my book! Also, I’m really intrigued by the idea of two souls in one body. I’m interested to see how she’s going to distinguish her plot and characters from other somewhat similar ideas! I haven’t read any of her work yet, but I’m definitely eager to read this series. It sounds really fresh and original. Thanks for the awesome giveaway!! Reading a story like this one is always so inspiring, and wow she just graduated from college but already have two books out? Not to mention both books are pretty popular. So admirable. I’m always so inspired by stories like this one, and wow she just graduated from college but already have two books out? So admirable. WOAH Kat wrote her first book at the age of 17? O_O I’m really into writing myself and at school, we’ve been told to write a gothic novel so I’ve been going around reading gothic novels which really helps. Wow I didn’t even realise that Kat published her debut novel at such a young age. I find it pretty hard juggling everything I do today, reading, blogging, commenting, reviewing alongside work and everything else, so I admire Kat’s patience and strength in trying to get her book out into the world, but also giving something back in return. Thank you for sharing this wonderful post with us ladies! Exactly–I feel like I barely keep up with what I’m doing, so the thought of her doing schoolwork, writing, and doing all the work of querying and such makes my head spin. I admire what she’s done to inspire other young writers so much, too. This seems like such solid advice. And Kat seems lovely. Thanks for sharing! Kat IS lovely! And I hope we continue to see more lovely books from her. These books look great and are getting good reviews on Goodreads! I’d definitely like to read them. this sounds fantastic! Thanks for sharing! The series is really great, Erin–hope you enjoy! What an amazing, educational post! The advice I’ve read here will definitely help me as a writer and I admire what Zhang has accomplished. Can’t wait to read her new book, and thanks for this opportunity! This book sound awesome. It sounds different but a good different. The feel of the series is very different from most YA scifi, Tammy–I hope you enjoy the books when you get around to them! Awesome advice. It’s absolutely insane that Kat wrote a book in high school. I’m a senior now and the thought of completing a book is mind blowing, especially with all the homework and responsibilities! I love the “you goals” advice because it’s something that has helped me a ton. I can be extremely competitive and so focusing on making myself better rather than being as good as the people around me has helped me a lot, especially the past few years. Thanks for stopping by, PE–I’m glad you enjoyed the post! We appreciate Kat sharing her experience with our readers. I’ve heard so much about this book – it looks excellent! I would love to win an ARC. PS I loved What’s left of me and it has checked out here 13 times!!! No worries–our comments are moderated, so they don’t always show up right away. I’m glad to hear WLOM is popular at your branch! Please come visit my Teen Writers group in Gallatin TN next time you tour! It would be amazing for them to talk to someone who started writing as a teen like they have! I loved your book and yes ordered it for my YA Collection.It has already been checked out 13 times! It’s amazing to see what Kat has accomplished, and so inspiring to other young writers, too. I love that she’s taken the time to write such an encouraging post about it. Publishing definitely seems like a sometimes-scary place to navigate–I like how reassuring Kat’s post is, even as she reminds everyone that basic knowledge of the genre and industry ARE necessities. I’d agree with her on that. I loved What’s Left of Me. I thought the writing was lovely and the dialog was particularly well done. I rated it a 4 when I reviewed it back in October. That is some excellent writing advice! I envy anyone who has the skill and perseverance to write a novel. The first book was a surprise to me, too, Donna! I thought it was really well done. I’m looking forward to seeing what she does after this series has concluded as well. Excellent post and WOW at writing a book while in college. Will need to read What’s Left of Me because it sounds right up my alley–I love the two people, one head idea (such as The Host did) and I’m sure there’s a lot more to it than just that. III know, the idea of writing a book in college is crazy. I admire her determination. And yes, this series is very different from The Host from what I understand. I’ve seen the movie (shhh), but have not read the book yet, but I think the similarities end with the basic/similar concept. Ah, she’s so cute! I love seeing dreams like this come true for such young authors. I’m totally jealous, too, but also proud to see such hard work pay off. I really enjoyed the first book and I’ve only just started this sequel, but I already have a feeling I’m going to love it, too. I like that it’s happened to such a grounded and sweet person, too! We’ll have to compare notes when you’re done, Jen, I’m hoping to start it this week as well. Oh, NIKKI. You should definitely give it a go sometime when you can. Kat’s writing style is really lovely. This is great advice – thanks so much! I can’t wait to read Once We Were. Hope you get your hands on a copy soon, Kaitlyn! There seem to be a lot of aspiring authors among YA readers, so we thought it’d be a good choice of topics. ;) Plus it’s just interesting to read Kat’s story in general–her career path is amazing! I love how you have given back to those who want to be where you are now and you are continuing to help aspiring writers with amazing tips. Well done! I really enjoyed your post. That was actually one of the things I really liked about Kat, Rebecca, and why I was glad to see she picked this topic to write about–that she’s already taken steps to give back. Mentors have always been really important to me, too, and I’ve liked mentoring others myself. It can make such a big difference in encouraging someone to take a chance on something they’re unsure about. Thanks for the giveaway and advice. I need to do step one and FINISH the book. But I can’t seem to sit down and finish it. Oh, it’s such a lovely book, Savannah! I just got my copy this week so I haven’t had a chance to read the sequel yet, but I’m very much looking forward to it. I hear you on the timing thing, though–time gets away from me, too. These are great tips for aspiring authors, thank you so much for sharing them, Ms. Zhang! I’m excited for Once We Were, I really liked the originality of What’s Left of Me…two souls, one body…I kept thinking that if I live in that world, will I be the stronger soul? I honestly don’t know. I’m glad you enjoyed the post, Amir–that’s an interesting question you raise re: if you’d be the stronger soul. I’m always so impressed (and completely jealous) of writers who found their way and did it brilliantly at such young ages. It’s absolutely applaudable and I wish Kat Zhang a long and prosperous career. Excellent post! I know, I cannot imagine doing that while in high school OR college–I barely had time to think about anything else but school! Well, and a few other things, hah. That kind of drive and discipline awes me–and I’m really happy for Kat’s success, too.